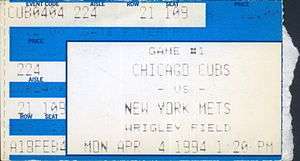 A ticket for the Cubs' 1994 Opening Day game against the New York Mets. The 1994 Chicago Cubs season was the 123rd season of the Chicago Cubs franchise, the 119th in the National League and the 79th at Wrigley Field. The Cubs finished the shortened season fifth and last in the National League Central with a record of 49–64. One of the highlights of the season was Karl "Tuffy" Rhodes hitting three home runs on Opening Day - all off Dwight Gooden of the New York Mets. The Cubs still lost the game 12-8. Rhodes would only hit five more homers that season and the Cubs would set a record by losing their first 12 home games. October 12, 1993: Steve Lake was released by the Chicago Cubs. November 24, 1993: Glenallen Hill signed as a Free Agent with the Chicago Cubs. December 14, 1993: Mike Maksudian was signed as a Free Agent with the Chicago Cubs. January 24, 1994: Dave Otto was signed as a Free Agent with the Chicago Cubs. March 30, 1994: Anthony Young was traded by the New York Mets with Ottis Smith (minors) to the Chicago Cubs for José Vizcaíno. The Cubs finished the strike-shortened season with a 49-64 record. They scored 500 runs (4.42 per game) and allowed 549 runs (4.86 per game). One of the most-memorable moments in Cubs history occurred April 29. 1994, after a heart-breaking 6-5 loss to the Colorado Rockies at Wrigley Field. The Cubs loaded the bases with one out in the bottom of the ninth only to have Glenallen Hill swing at the first pitch he saw and ground into a game-ending double play. The loss was the ninth consecutive home defeat for the Cubs to start the season and dropped the club to 6-15. Manager Tom Trebelhorn had vowed to meet fans outside the ballpark if the Cubs lost another home game and was true to his word, wading into a crowd of some 200 angry fans gathered at a fire station on Waveland Avenue just outside Wrigley's left-field wall. The confrontation started ugly, but within a half hour, Trebelhorn, who was known for his quick humor and good nature, won over most of his detractors. The team went on to lose three more home games before snapping the record streak with a 5-2 win over the Cincinnati Reds on May 4, 1994, but by then Trebelhorn's "Firehouse Chat" was a memorable moment in Cubs' history. The season, which ended when Major League players went on 1994–95 Major League Baseball strike Aug 12, was Trebelhorn's only as manager of the Cubs. He was replaced in 1995 by Jim Riggleman. May 16, 1994: Willie Wilson was released by the Chicago Cubs. July 27, 1994: Mike Sharperson signed as a Free Agent with the Chicago Cubs. ↑ Baseball Almanac. "New York Mets vs Chicago Cubs". Retrieved February 21, 2013. ↑ Reaves, Joseph A. "Cubs Still At A Loss For A Win". Chicago Tribune. ↑ Baseball Almanac. "Chicago Cubs 1994 Schedule". Retrieved February 21, 2013. ↑ Baseball America. "Chicago Cubs 1994 Schedule". Retrieved February 21, 2013. ↑ Reaves, Joseph A. (April 30, 1994). "Trebelhorn Manages To Win Fiery Fans". Chicago Tribune. Retrieved February 21, 2013.